Fig. 89 Income per head. GNP, total and per capita, for selected countries. 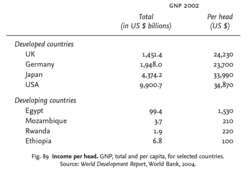 Source: World Development Report, World Bank, 2004.
the GROSS NATIONAL PRODUCT (GNP) of a country divided by its POPULATION. Income per head gives a more general indication of a country's monetary STANDARD OF LIVING than its absolute level of GNP: as Fig. 89 shows, although the USA has a much higher absolute level of GNP than Japan, its income per head is only slightly higher. However, an income per head measure of people's standard of living is itself also flawed as an indicator of typical living standards because, in practice, the distribution of income is not equal and non-monetary elements of lifestyle quality differ as between different people. See PERSONAL DISTRIBUTION OF INCOME. For the first time since 1991 global average income per head is falling. Haq produced sophisticated tables in which countries were not ranked by income per head but by yardsticks more telling - longevity, knowledge and a decent standard of living. The Koreans might feel a bit slighted by being currently grouped in this "third division" when their income per head statistics (for example) turns the N11 average from $2,357 per head (N11 ex-Korea) to $3,069 per head with Korea. Food inflation can leave people hungry a" and the reason is simple: a greater portion of income per head in Saudi Arabia is now allocated to the purchase of food, he said. While disposable household income per head in London was 23% above the UK average, the North East came in at 14% below, a report from the Office for National Statistics has shown. Bihar is India's poorest state with the lowest income per head despite being a religious centre for Hindus and Jains. In terms of income per head New Zealand is in 22nd place (compared with 21st two years ago). While income per person declined in the early 1990s, the recent growth surge has been sufficient to get income per head growing at 3% per year--a significant achievement given the region's high population growth. It is widely quoted that Nigeria and Malaysia enjoyed the same income per head of population at independence but their very different histories are borne out by the massive difference in income today. MODERN Ireland was lauded last week when Conservative MP Oliver Letwin popped up on BBC2's Newsnight and admitted the Irish have now passed the UK for income per head of population. Countries in Asia," he says, "have actually been narrowing the gap substantially: There, excluding already-developed Japan, in 1950-2001 income per head increased fivefold.